Wool and Wheel: Maple leaves socks. 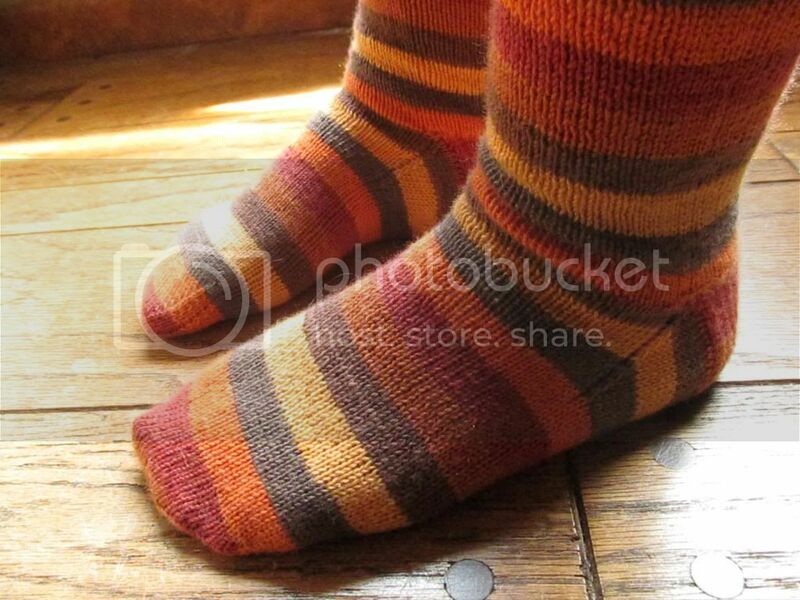 These fall socks were knit almost entirely in the car over a few weeks. 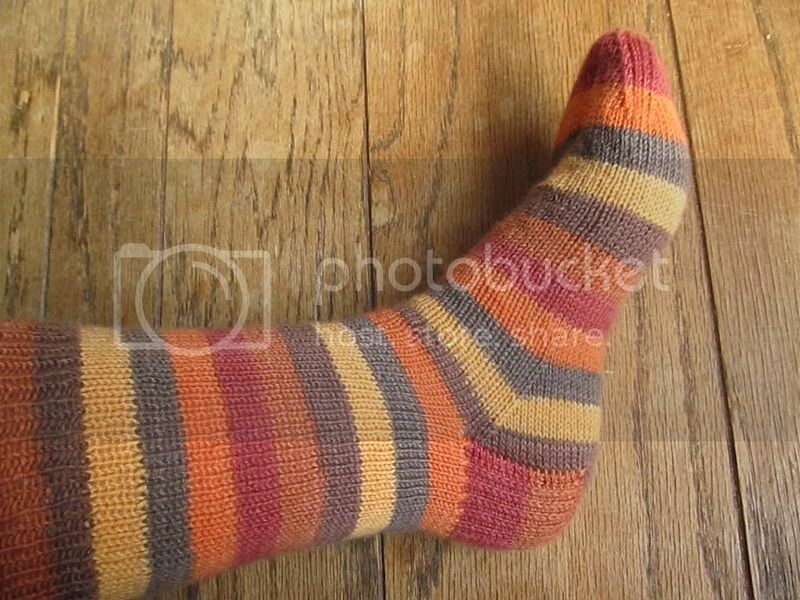 The yarn is Felici Self-Striping from Knit Picks, in the maple leaves colorway. The colors are kind of tacky, but they're so wonderfully fall-like at the same time. 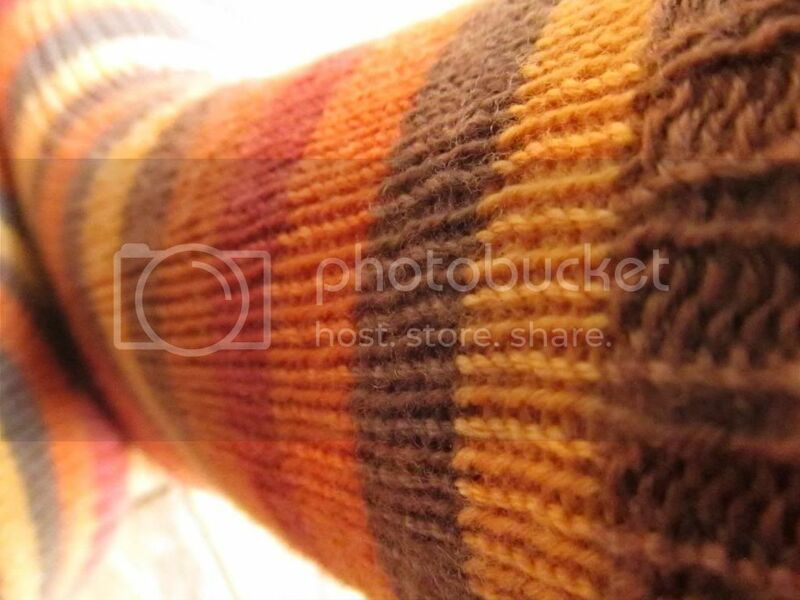 :) I attempted to match the stripes, but as you can see, things somehow got off by about half an inch around the heel. Self-striping yarn is so much fun, though...they seem to go by quicker. I used the same basic pattern that I've used for my previous three pairs of socks (one, two, and three): Silver's Sock Class. I did make a couple of tiny changes, though. Instead of doing the whole leg section in ribbing, I only did two inches of ribbing at the top. I just really love how smooth and consistent stockinette looks, and plus I still get noticeable ladders in ribbing at the points where my DPNs meet. Also, instead of 2x2 ribbing, I did 1x1. And I went down a needle size. All of my previous socks were knit on 3's, but they're kind of slouchy so I went down to a size 2 to see if these socks fit me better. I love these socks. 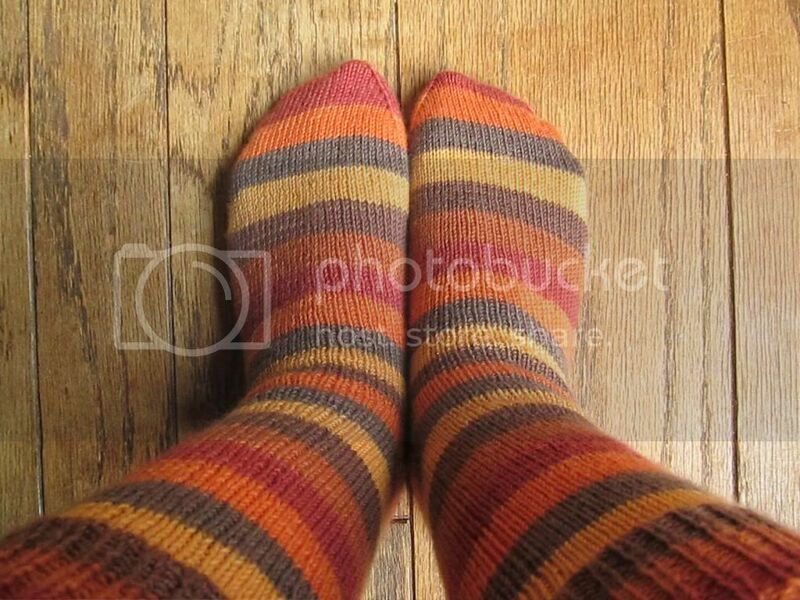 I love handknit socks in general. :) I have some really pretty sock yarn that I'm excited about knitting up, but that probably won't happen until the beginning of 2014 because I really need to start working on Christmas gifts now. As usual, for more info check out my Ravelry project page here. SO CUTE! In the winter, I type with fingerless gloves b/c my hands are always cold. I would love to find some that extend further than my wrist. And don't look like gloves I bought at the dollar store and cut the fingertips out of (which is exactly what mine are - ha :). I need an adorable pair. I wear the dern things all day long. Your cute socks have reminded me to renew my search.